Could my baby be born with Down's syndrome? Your baby's chances of having a chromosomal abnormality, like Down's syndrome, are determined by the baby's nuchal fold measurement, your age, and hormone levels (PAPP-A HIG). Your age is factored in because although anyone can have a baby with a chromosomal abnormality, the risk increases as you age. Nuchal translucency screening helps assess your baby's risk of having chromosomal abnormalities, as well as major congenital heart problems. The two parts of the screening process are a nuchal translucency ultrasound and a blood test when you are between 11 weeks and 2 days to 14 weeks pregnant. The nuchal scan allows us to measure the clear (translucent) space in the tissue at the back of your developing baby's neck. 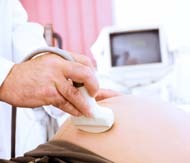 It is a noninvasive diagnostic test that uses sound waves to create a visual image of your baby, placenta, and uterus. Babies with abnormalities tend to accumulate more fluid at the back of their neck during this stage of pregnancy, causing this clear space to be larger than average. The blood test measures the risk associated with your age, and increases the detection rate. Parents may decide that it does not matter to them to have a child with a disability and can therefore opt out of screening. Before the screen, we advise parents to discuss what they may decide to do if their screen indicates an unacceptable level of risk. The nuchal scan is not 100% accurate and couples need to consent that they understand this. Like other screening tests, a nuchal scan won't give you a diagnosis, but it can assess your baby's risk for certain problems. If the risk is low, the results will offer you some reassurance. If the risk is high, you will have the opportunity to consider amniocentesis or chorionic villius sampling (CVS) to find out whether your baby is actually affected. These tests are more invasive but establish the risk with greater accuracy. Because the nuchal scan requires special training and equipment, it is not available everywhere. At Richmond Practice our private consultant gynaecologists and obstetricians are specialists in fetal maternal medicine. Their experience includes working in a tertiary referral centre (where doctors refer at-risk pregnancies or where pregnant couples can go for a second opinion.) We offer the nuchal scan as part of a comprehensive package of maternity care available to private patients or to couples who need help on a one-off basis.